Contactless payments are on the rise. At least one study suggests that 70 percent of all transactions will be contactless in a few years. The popularity of contactless payment is hard to ignore. Consumers around the world have been quick to adopt it. Businesses with low transaction values and high volumes have noticed the most demand. If your business doesn’t yet accept tap credit cards, you might be considering it as a payment option. You’re wondering about the pros and cons though. Our guide reviews both the advantages and disadvantages of contactless payment. With this knowledge, you can prepare for the challenges of contactless payments. Credit card companies started rolling out cards with RFID technology a few years ago. With this technology, card information is transmitted wirelessly to the POS terminal. 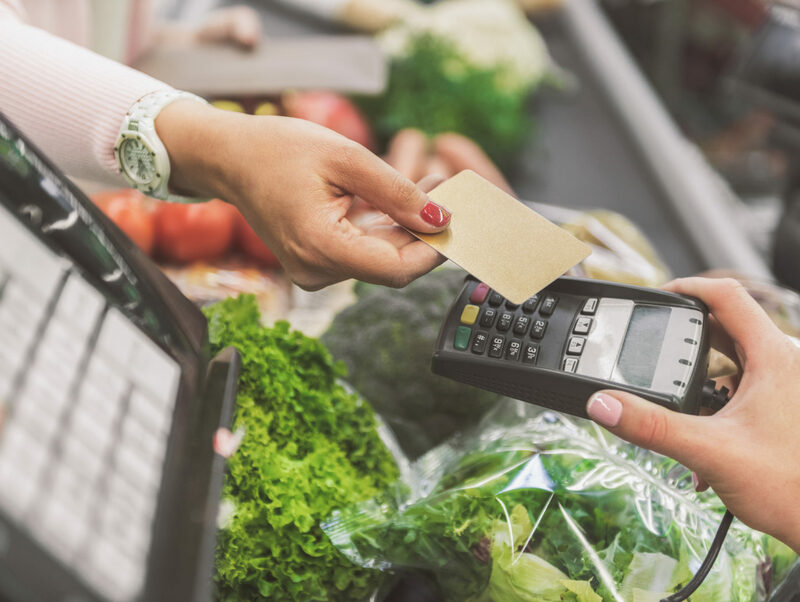 With a contactless card, your customers can quickly pay for their purchases. All they have to do is tap their card to complete the transaction. This speeds up the payment process. Your customers don’t have to wait for the bill to print so they can sign. They don’t even need to enter a PIN, which saves plenty of time when they enter it wrong or can’t remember their code. PayWave is Visa’s name for their contactless RFID payment technology. MasterCard calls theirs PayPass. All these are tap and pay credit cards, which use the same technology to make payment easier. We’ve already touched on a few of the advantages of contactless payment for your business. The biggest one is how easy it makes payment. With the tap of a card, your customers can instantly complete transactions. This means it’s much faster for them to pay. No more waiting around to sign the receipt or punching in their PIN. This increases the speed of transactions, which makes them more efficient. The reduction in processing time can improve your employees’ productivity. They may be able to serve more customers. Tap credit cards also improve customer satisfaction. Using contactless gets your customers out the door and back to their busy day sooner. It also means they don’t need to wait for the cashier to count back change, and they don’t need to double-check the math. Another major advantage of a tap credit card is the improvement to security. The card never has to leave the customer’s hand, which means it’s less likely to be stolen or lost. Your cashier doesn’t have to remember to hand it back at the end of the transaction. Most cards use chip technology designed to increase security. This makes it more difficult to steal their information, even during a transaction. Visa tap to pay and other contactless payments also help you maintain PCI compliance. Most cards use technology that meets or exceed the standards set out by the Payment Card Industry. There are no additional fees for a merchant who accepts contactless payments. If you accept credit card payments, adding contactless options is easy. All you need is the right hardware. We suggested most tap and pay credit cards use technology that focuses on security. The fact they’re PCI compliant should also help reduce concerns about security. RFID skimmers can collect card data from as little as one meter away from the card itself. The card doesn’t need to be used in a transaction to be skimmed. The card stores data such as its number, expiry date, and PIN in its chip.Cybercriminalss use devices to “read” chips and collect the data stored on them. When you tap the chip, it sends the information over the network. This is an opportunity for fraudsters, who then intercept the credit card information. Since the transaction doesn’t need human entry of a PIN or password, fraudsters don’t even need to know the PIN for a card. They can load the information onto a chip and then use a fake card. There are steps you can take to make sure that this can’t happen. For example, you should be sure to use encryption for all your transactions. PCI compliance will also help you achieve better security. There are another couple of more minor issues with contactless payment at the moment. The first is reach. RFID and Near Field Communication (NFC) technologies use tiny antennas. They’re also designed to use as little power as possible. This means that a tap credit card can only be read at a close distance, usually mere inches or a few feet. This is a good thing in some ways, since it means you have to be close to the card to read it. It can cause problems if you don’t have a mobile terminal. Merchants also have the option of setting transaction limits for contactless payments. For example, you might decide that someone can buy up to $50 using a contactless card. If their bill is higher, they’ll need to use chip and PIN or sign. This can slow down transactions, and some of your customers may find it frustrating. It’s a measure to protect them, since it stops people from using stolen cards to make large purchases. It also protects you from fraud. Despite security concerns, consumers around the world are embracing contactless payment. The number of payments completed with tap and pay credit cards is going to continue growing. Is your business ready to get on board with the new payment wave? If so, talk to us. Our team of experts can help you find the right hardware to make contactless payment a reality for you.